About 80 percent of all wealth generated in the world comes from the cities, which attract millions of people every year in search of opportunities. There are already 3.9 billion people living in urban areas and, in 2050, that number will be 9.6 billion. However, a lack of planning has been costly for individuals, governments and the planet. Cities consume two-thirds of global energy and are responsible for over 70 percent of CO2 emissions. It is therefore not a coincidence that making cities sustainable is featured in one of the 17 Sustainable Development Goals (SDGs), which were adopted last year by the United Nations. With this set of 169 goals, the global agenda aims to end extreme poverty, inequality and injustice, and minimize the impacts of climate change by 2030. The 193 UN member countries are now committed to inclusive, secure, resilient and sustainable cities. Additional agreements reaffirm this position, such as the Compact of Mayors. During COP 21, which was held in December in Paris, the Compact of Mayors, the largest coalition focused on helping mayors combat climate change, announced the aggregate impact of their initiative: the 400+ commitments made by urban leaders so far have the potential to contribute to a 50 percent reduction of greenhouse gas greenhouse in the world by 2020. And transport is a key factor in changing the direction. Transport infrastructure directs and determines the spatial structure of cities. Integrating transport planning and land use planning can accommodate growth without expanding urban areas. Sprawling cities have repeatedly been shown to be the world’s most unsustainable communities. Copenhagen, for example, has a density 4.8 times that of Houston while its per capita annual emissions are just 4.7 tCO2 compared to the American city with 14.1 tCO2. Because it is impossible to prescribe universal actions for sustainable mobility, each urban center needs to recognize its unique context when trying to transfer international best practices. An appropriate strategy is the Avoid-Shift-Improve framework, which balances sanctions and rewards and builds success in the short term while aiming at longer horizons. Some actions can reduce greenhouse gas emissions, improve road safety and increase the efficiency of transport systems. Others can incentivize people to switch from cars to more sustainable modes such as walking, cycling and public transport. However, the most sustainable initiatives are those that target the long term and avoid displacing people, while also satisfying the basic needs of the community. This includes transit-oriented development (TOD), people-oriented urban planning models and integration of transport and urban planning. Prioritizing public transport has proven to reduce traffic deaths. Ahmedabad, India, and Bogota, Colombia, reduced the number of fatalities along corridors after introducing bus rapid transit (BRT) systems by 55 percent and 48 percent, respectively. No real change, however, can be achieved without including public participation and a focus on meeting local needs. This reinforces the importance of engaging communities in formulating their mobility plans. 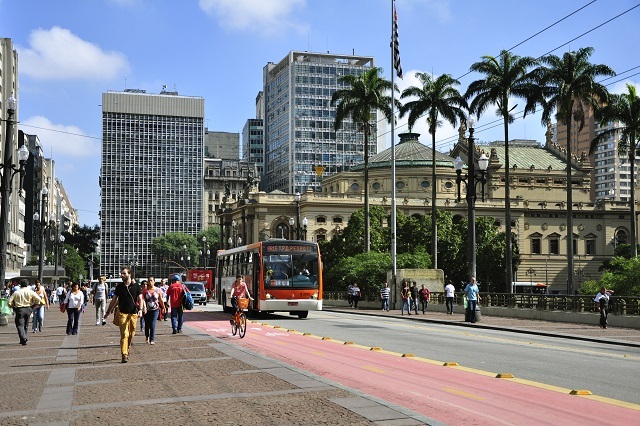 Furthermore, with Brazil’s private sector responsible for 50 percent of commutes in urban centers, a range of actors will need to take responsibility for addressing the role of transport in sustainable cities.